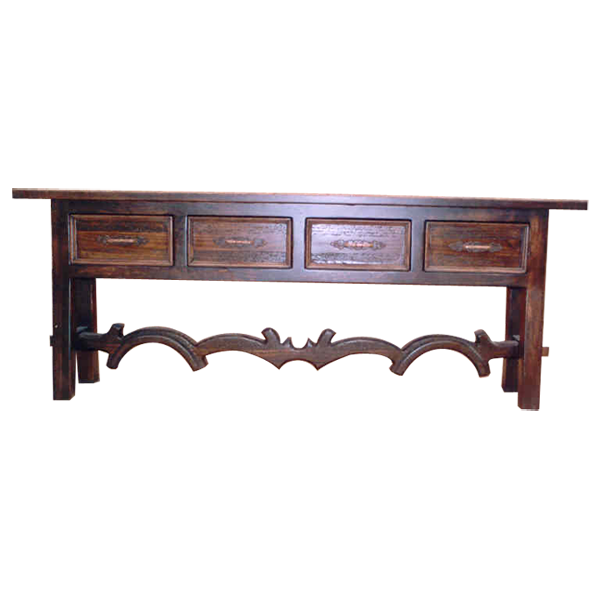 This handcrafted, Western style console blends beauty with practical functionality. The front of the console has four horizontal, rectangular drawers, and centered in each drawer is a hand forged, iron handle. The console is finished with a lovely, brown antique stain, but it can be finished in a stain color appropriate for your home décor. The console is supported by four, slightly splayed, square cut legs, and the legs are joined by “H” shaped stretchers. The opposing legs are connected by a spectacular, curved, yoke shaped crossbar. The console is made with the best, sustainable, solid wood available, and it is 100% customizable.